Looking down at th Roaring Fork River from Two Rivers Road at the location of the whitewater park that Pitkin County is building in the river. The river is now closed to boaters from Fisherman's Park in Basalt to below the construction site, according to the county. BASALT — Pitkin County Attorney John Ely said Monday that the county had “closed” the Roaring Fork River at Fisherman’s Park in Basalt so that boaters don’t run into dams the county is building as part of installing a whitewater park. Ely said the temporary rock dams would be “a significant hazard.” There will initially be two cobble dams pushed up in the river, one just below the other, but eventually they will function as one diversion structure. The river is to be closed for boating and other uses from Fisherman’s Park, on upper Two Rivers Road, through the construction site, where two wave-producing concrete forms are to be installed. 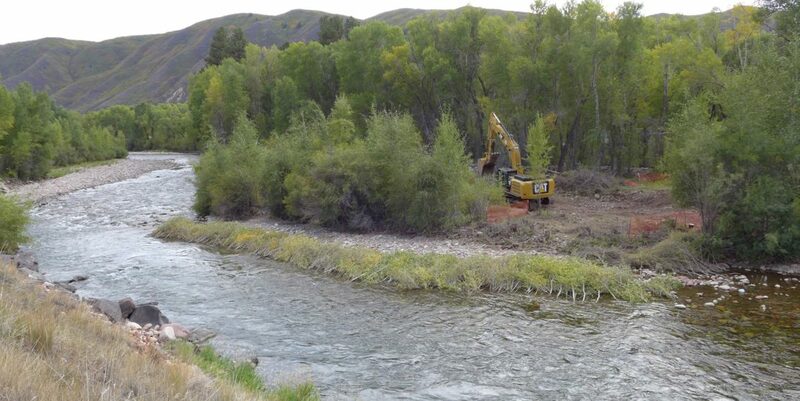 On Monday, crews with Diggin’ It Riverworks Inc. out of Durango, were using an excavator in a dry river channel, on river left, to shape a bypass channel. The dams will direct the flow of the river into the bypass channel and, for a short stretch, through a 60-inch pipe. The Fork was flowing past the job site at about 215 cubic feet per second on Monday. The work is being staged from the cul-de-sac on upper Emma Road, just upriver from Stubbies Sports Bar. By Monday afternoon crews had built an access road from the cul-de-sac to the edge of the riverbank. The excavator will next get in the main channel and build up the diversion dams. An excavator working on the bypass channel for constructing the whitewater park in the Roaring Fork River in Basalt, on Sept. 12, 2016. Work in the channel itself is expected to begin soon. Boating traffic is light on this section of the Fork this time of year, as boaters — be they rafters or anglers — are more likely to put in below the Fryingpan River, which adds another 300 cfs to the Fork’s flow. But there’s still perhaps enough flow in the Fork above Basalt for an enthusiast in a kayak or ducky to bounce down the river from the put-in at Wingo Junction. On Monday morning, a message from the county on Aspen Public Radio announced that the river was closed. And the county intends to put up warning signs directing any boaters to take out at Fisherman’s Park, which is river-right just below the low Highway 82 bridge. It’s about four blocks along Two Rivers Road from the take-out at Fisherman’s Park to the end of the in-channel work. The next obvious river access is farther downstream, at the bridge on Basalt Avenue by the 7-Eleven store. And the next boat ramp suitable for a small raft is on Willits Lane by the Fed Ex facility. The project also includes work on the eddy and the ramp at Fisherman’s Park, so at some point taking out there will also be ill-advised. Ely said he expected that the river would be put into the bypass channel by Oct. 1 and that the river might be returned to the main channel by Dec. 1. The overall project, at a cost of $770,000, is to be completed by Feb 1. As of now, the closure is scheduled through Feb. 1. 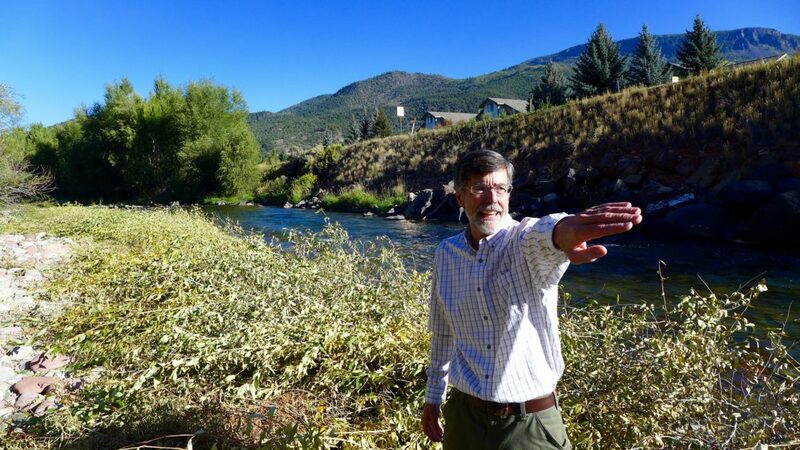 Pitkin County Attorney John Ely on Sept. 12, 2016, pointing out aspects of the county’s whitewater park project. 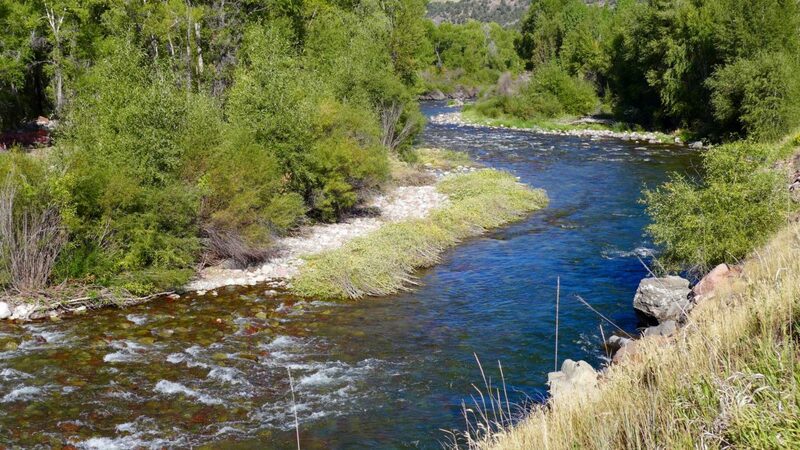 The project is being managed by the county attorney’s office as the project is primarily about securing a recreational in-channel diversion, or RICD, water right. When asked if the county had the legal right to “close” the river to boaters — and other river users, including anglers — Ely said the county owned the land under the project site and had all the permits in place to do the earthwork. And state water law allows for the diversion of water. Boaters may still have the legal right to float to the construction site, but they will be met with a hazardous dam and an impassable bypass channel if they do. Ultimately, boaters may appreciate that the temporary in-channel work is expected to yield two play waves, more flow in the river and a recreational water right. Ely said that the state law around water rights for recreational in-channel diversions, or RICDs, required that two structures be installed in the river. Ely said he expects that kayakers will surf the play waves, and then get out on river left and walk back up to do it again. The public land on river left along the whitewater park is owned by either the town of Basalt or Pitkin County. Ely said he expects people to get to the surf by driving up Emma Road, parking in the cul-de-sac, and walking the short distance to the play waves. Editor’s note: Aspen Journalism and the Aspen Daily News are collaborating on the coverage of rivers and water. A version of this story was published in the Daily News on Sept. 13, 2016. The printed version contained a reporting error regarding the timing of the project, as it said the river would be restored to its main channel in October. However, the river is to be moved to the bypass channel by Oct. 1 and returned to the main channel — perhaps — by Dec. 1.